The 2018 Athens North Pole Stroll will return to Big Spring Memorial Park during the month of December with trees decorated with twinkling lights and decked with the creativity of area agencies, groups, businesses, and families. The 2018 event will be from December 1st through the 28th. ​Any questions about this event can be directed to the Athens-Limestone County Tourism Association by calling 256-232-5411. Due to unforeseen events, trees coming from Lowe's third-party vendor are delayed and thus delaying setup for the event due to severe winter weather in their region. Thank you for your patience as we adjust scheduling to these arising circumstances. We would also like to offer our sympathy to the family, friends, and co-workers of Ben Wiley, the Director of Athens Park and Recreation. Ben passed away suddenly Thanksgiving weekend and was laid to rest on Wednesday. Ben was a tremendous supporter and partner of this annual event - arranging the staking of the tree, helping with other decorating needs, and making sure the Big Spring Memorial Park was ready for the event itself. We truly miss him and wish to thank all the Park and Recreation employees who are continuing on in the face of their grief and sorrow to help the event move forward. 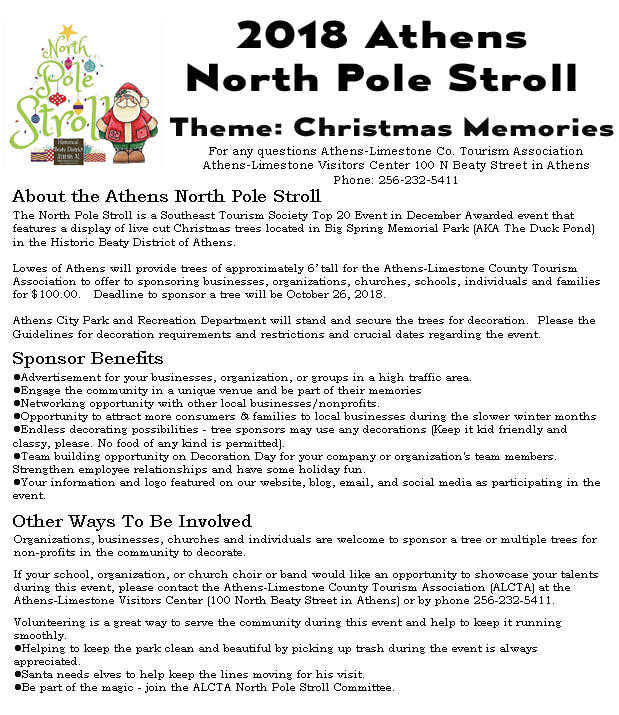 To coincide with the Alabama 200, Limestone County 200, City of Athens 200, the Mooresville 200 and to continue the theme of Trustmark's Athens Christmas Parade theme of "Bicentennial" - this year's theme of the Athens North Pole Stroll will look back at Christmas Memories. Hopefully, the many cherished memories of Christmas of days-gone-by of the decorators of this year's event in a variety of decorations - photos, stories, hand-crafted items, and whatever the imagination brings to life will adorn the trees that will fill Big Spring Memorial Park in Athens. The location, Big Spring Memorial Park, is the perfect backdrop for this annual festival that was awarded the Southeast Tourism Society's Top 20 Things To Do In December 2018 accolades. The pond has roots in the City of Athens' history as well as the settlement of North Alabama itself - making a perfect place to mark "Christmas Memories" and the 2018 Bicentennial Christmas passing. What are the guidelines for decorating my tree? IMPORTANT: Please secure all decorations to your tree using pipe cleaners, small zip ties, or other strings/ties to prevent hook ornaments from falling off in the wind. Decorators must provide their own decorations and lighting. Decorators must use Solar Powered LED outdoor lights only. We reserve the right to remove any lights that are not LED. We recommend using 4-5 strings of LED outdoor lights per tree. Edible items used to decorate are prohibited including but not limited to candy canes, popcorn, and birdseed. 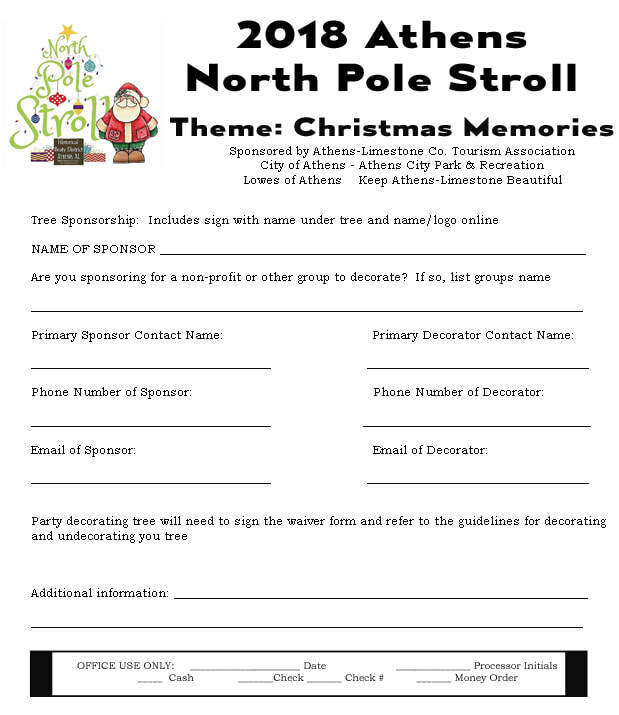 Athens North Pole Stroll will provide each sponsor/ decorator with one live Christmas tree, signage listing the sponsor/decorator, and a spotlight to light the sign. Athens Police Department will increase patrols in the park. Please, no offensive or inappropriate decor. We reserve the right to remove offensive displays. Please check your tree and decoration regularly - especially after windy or rainy days. Please be available and adhere to setup and takedown dates. It is crucial the park be restored to its natural order by December 31st. What is the Athens North Pole Stroll? Athens North Pole Stroll is a display of live Christmas Trees in the heart of the Historic Beaty District set beside the beautiful pond. The trees are decorated by local businesses, organizations, churches, non-profits, and individuals. Open from December 1st through 28th, the trail is free and open to the public. Athens North Pole Stroll happens in Big Spring Memorial Park between North Beaty Street and East Street in Athens. This event is organized by the Athens-Limestone County Tourism Association. Purchase a tree for decoration or sponsor a tree for another party. Sizes and Prices are To Be Announced. Each tree will be provided a sign listing Sponsor and Decorator and a solar spot light to light the sign. What do I put on my tree? 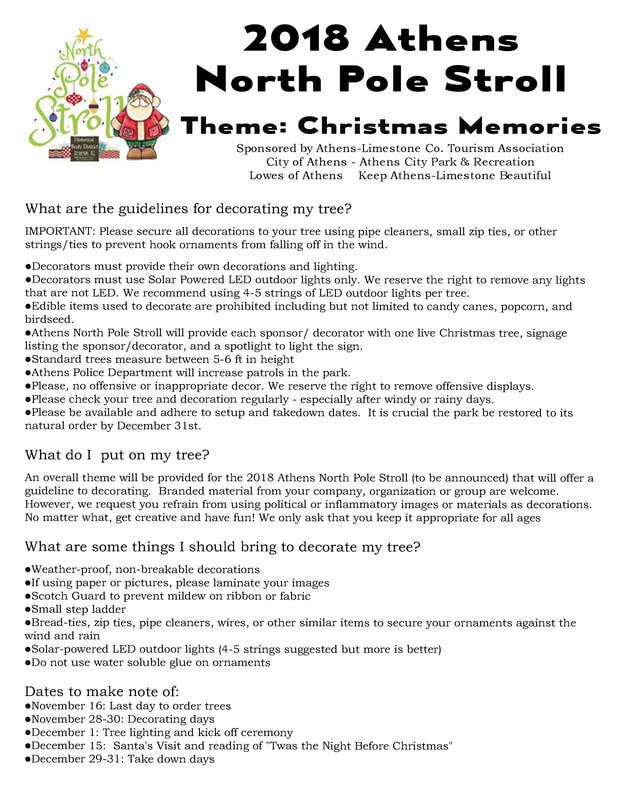 An overall theme will be provided for the 2018 Athens North Pole Stroll (to be announced) that will offer a guideline to decorating. Branded material from your company, organization or group are welcome. However, we request you refrain from using political or inflammatory images or materials as decorations. No matter what, get creative and have fun! We only ask that you keep it appropriate for all ages. When does the Athens North Pole Stroll happen and for how long? Athens North Pole Stroll happens from December 1st to December 28th and is available in the park 24-hours a day. The lights will be operational starting at dark, approximately 6:00PM. Where can I park to access Athens North Pole Stroll? Visitors will find parking within Big Spring Memorial Park off of North Beaty Street as well as limited parking on East Street. 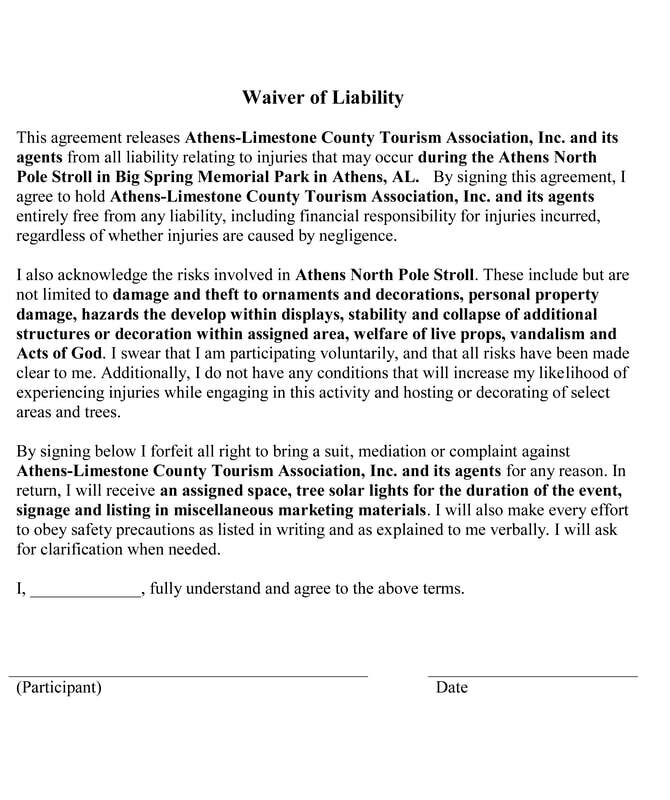 Do I have to pay to visit Athens North Pole Stroll? No, this event is free and open to the public. What are some things I should bring to decorate my tree? December 15: Santa's Visit and reading of "Twas the Night Before Christmas"
If I don't want to decorate, What Kind of Sponsorships are Available? Organizations, businesses, churches and individuals are welcome to sponsor a tree or multiple trees for non-profits in the community to decorate. If your school, organization, or church choir or band would like an opportunity to showcase your talents during this event, please contact the Athens-Limestone County Tourism Association (ALCTA) at the Athens-Limestone Visitors Center (100 North Beaty Street in Athens) or by phone 256-232-5411. ​Volunteering is a great way to serve the community during this event and help to keep it running smoothly. Helping to keep the park clean and beautiful by picking up trash during the event is always appreciated. Santa needs elves to help keep the lines moving for his visit. Be part of the magic - join the ALCTA North Pole Stroll Committee. Advertisement for your businesses, organization, or groups in a high traffic area. Networking opportunity with other local businesses/nonprofits. Opportunity to attract more consumers and families to local businesses during the slower winter months. Endless decorating possibilities - tree sponsors may use any decorations (Keep it kid friendly and classy, please. No food of any kind is permitted). Team building opportunity on Decoration Day for your company or organization's team members. Strengthen employee relationships and have some holiday fun. Your information and logo featured on our website, blog, email, and social media as participating in the event. These Nonprofits are looking for sponsors. Contact us on sponsoring them.